USBisoVM is a unique data acquisition device that uses a standard USB port. Plug it into your RMS unit or into a Computer. USBisoVM has six +/- 100 VDC electrically isolated voltmeters. USBisoVM uses six 24 bit Delta Sigma ADC,s to deliver accurate DC voltage readings. 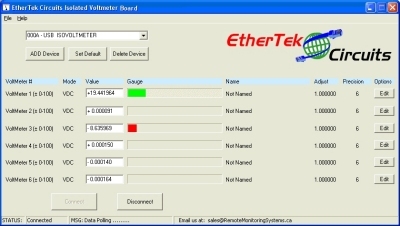 The USB isolated voltmeter board (USBisoVM) has 6 isolated voltmeters that transfer data back to a control module via USB. The USBisoVM is a monitoring device only, and requires either a PC,SBC, or RMS unit to communicate. Each voltmeter is capable of measuring up to +/-100 VDC with 24-bit accuracy. The data and power lines for each voltmeter are isolated with a chip-scale air core transformer. This enables each voltmeter to measure different DC voltage sources without any effect on the main board or other voltages. individual batteries in a battery bank. be drawing or generating power. solar panel voltage and amperage. wind turbine voltage and amperage. battery charger voltage and amperage.